On the evening before heading out to Austin on our annual Thanksgiving trip, my mother-in-law Brenda took us out to dinner. The boys had worked themselves into a pre-trip frenzy, and we needed a break. We had planned to check out the new offering from EAT, The Fat Dragon but alas, and luckily for us, they were closed. We headed over to the Museum District to check out The Belmont Food Shop. I've chatted with several "foodie" friends who claimed it was one of the best meals they had eaten in Richmond for the past year. From the moment I walked in the door, I fell in love with the atmosphere- soft lights, 20's-30's music, distressed wood. It felt comfortable, with a touch of nostalgia. We sat at a window table with a view of a quiet Sunday night street. Brenda ordered her usual "Vodka Tonic", but it was made special with homemade tonic, pinkish, and sharper. Even the ice cubes take us back, chopped off a block, irregular. The prix-fixe is one of the best deals in town- Appetizer, entree and dessert for $30. 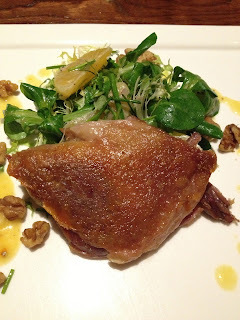 Started with a duck confit salad - crispy on the outside, tender and moist on the inside, served over a bed of well dressed greens. 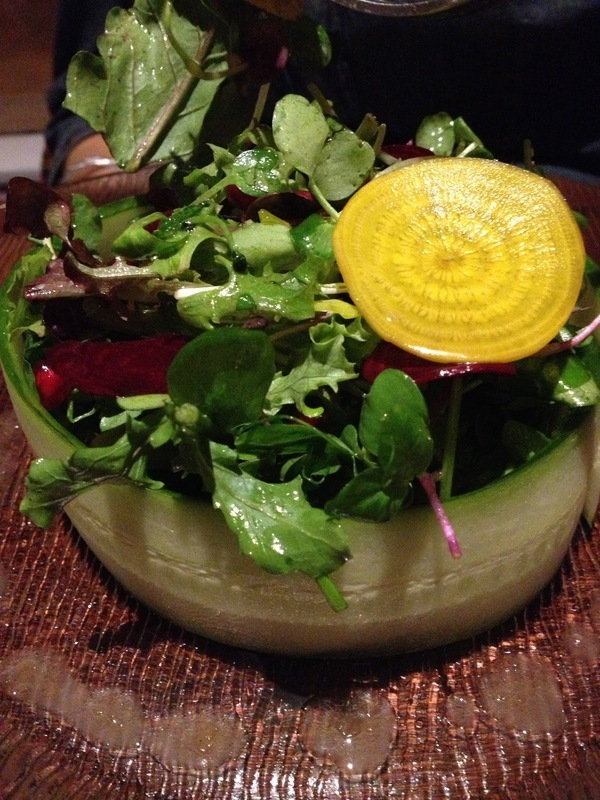 Susannah and her mom each had a simple green salad, elegant in presentation with fresh greens sourced from Manikantowne. 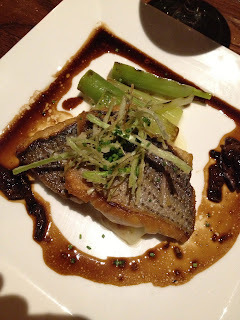 Rockfish was perfectly cooked and served over an earthy parsnip puree and roasted leeks. Peanut butter and grape jelly is an iconic childhood meal. The grape used for the jelly the Concord, a relatively recent variety, not grown in the US until the mid 19th c. Chef Mike Yavorsky, CIA grad and owner of The Belmont Food Shop, magically transforms the Concord Grape into a subtle multi-layered panna cotta, each strata with a different mix of grape and cream. Lovely. Yavorksy spent a few minutes chatting with us, excited about his relatively new venture. He buys locally as much as possible, but shares the challenges he faces in preparing affordable meals. He is very purposeful and thoughtful in buying off cuts of meat when he can and his changing menu reflects his process. I look forward to going back as the seasons change and see what surprises he has up his sleeve. He is clearly passionate about what he does, and I hope that he succeeds in his new venture. I plan to do what I can to help in that process.